One of nine children, Nyura lost her mother and her six sisters and two brothers in the 1988 Gyumri earthquake. It was 30 years ago, but her sorrow is still fresh. Each time she speaks about her mom and siblings, tears silently wet her face. “I have lived a messy life,” she said. Nyura was 14 when her father married her off, but it was short lived. After her divorce in 1966, at age 15, she studied to be a teacher in Gyumri. In 1969, she started working as a kindergarten teacher’s assistant in Gyumri and Vanadzor until the earthquake. After the earthquake, Nyura started working in a hospital as head of custodial services—a more prestigious and well-paid job—until she lost that job in 2001. Then, 15 years ago, Nyura met Rudolf through mutual friends. She said they were happy every day of their marriage. Whatever Nyura does, she said her thoughts and mind are with her husband. “He was a great man, a very good husband. We used to read the Bible together every night; we used to dine and learn new things together. It’s hard ….” she said, trailing off. He died at age 82. After the loss of Rudolf, Nyura’s health got worse and she was diagnosed with diabetes and high blood pressure. Then she had to sell her house to support her late husband’s son because he had financial difficulties. 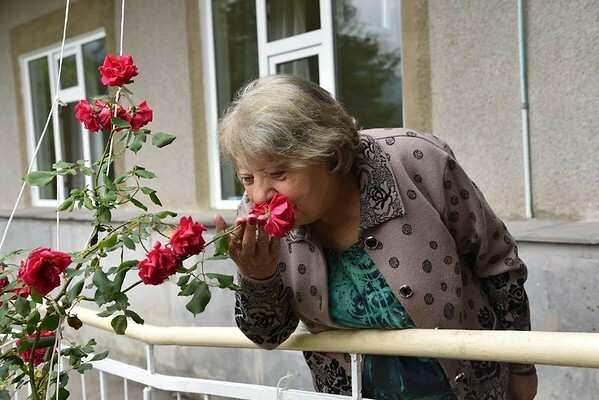 With no true family to lean on and no one to turn to, Nyura, a Vanadzor resident, came to VOAH quietly and on her own. At VOAH, Nyura has built a new life for herself. She has found friends, many of whom she calls her “new family.” She likes the staff and now starts her day off (weather permitting) with a walk through VOAH’s well-maintained rose garden. She joins 50 other seniors, most of whom have also faced tragedy and loss in their lives, and who have suffered through poverty, but who have found peace at VOAH, a place they like to call home. The Vanadzor Old Age Home (VOAH) is a FAR project sponsored by the Kevork and Sirvart Karamanuk Foundation and supported by the Women’s Guild Central Council of the Diocese of the Armenian Church of America (Eastern).